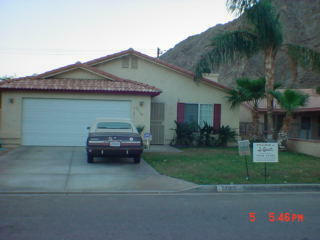 Detached Home La Quinta Cove Hill/mountain view. 77165 Calle Durango. This 8 year old single story detached home has 3 bedroom(s), 2.00 bath(s) and is approximately 1361 sq. ft. Other features include ceiling fan(s), skylight(s), window treatments. This home has a 2 car garage. The property is located on 0.11 acre(s). This home has handicap features. Also features: Storage room, Tile roof, Laundry area in garage, Curbs & gutters, Gas or electric laundry hookups, Attached garage, Living room fireplace, Paved driveway, Security features, Automatic garage door, Gas range and oven, TV cable available, Disposal, Satellite dish, Dishwasher, Public water supply, Central air conditioning, Lot is 4792 sq. ft., Slab foundation, Auto watering system, Tile flooring, Elementary School: Adams Elementary Sch, French door(s), Middle School: La Quinta Middle Sch, Wood fencing, High School: La Quinta High Schoo.